As well as its monthly individual tournaments the RBC Golfing Society organises or participates in other annual events. Team matches against other clubs and societies include the annual Barmen match, which has now been going for thirty years, and the Tri-Society match. A more recent innovation has been the Gordon Young Putter Competition, a putting knock-out open to all RBCGS members that is played over the early months of each season and is supported by Estoril-based professional, Gordon Young. Reports on recent editions of these events can be read below. Golf Club to play the annual challenge between the 3 Societies. 8 people from each Society play a Stableford competition. The best 6 scores from each Society are selected and the winning Society is the one which totals the most points. It was a lovely warm sunny day and the course was in excellent condition. This resulted in high scoring and amongst the 18 scores only one had less than 30, and in fact, that was 29. Only 17 points separated the three sides and the deserved winners were Tagus, with a total of 206 points, an average of 34 per player. In second place came RBCGS with a total of 199 points, an average of 33 per player, and Pings in third place totalled 189, an average of 32 per player. Individually Paul Guérault for Tagus managed a remarkable 42 points, and this was recognized with a token prize. 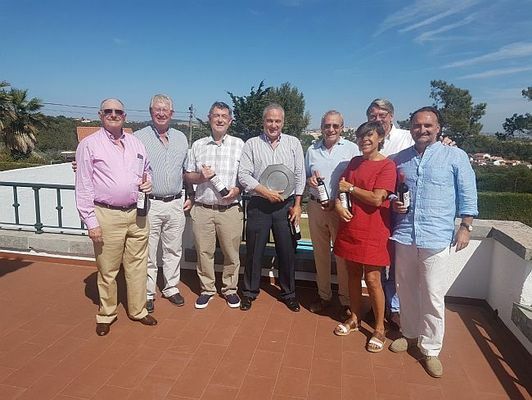 The tournament was played with a wonderful sporting spirit and this level of friendship continued off-course in the bar and at the lunch which followed on the Estoril Golf Club veranda. We look forward to continuing the battle next year. The Royal British Club Golfing Society gathered together at Estoril for its summer game of Texas Scramble. Luckily for players the extreme heat of the weekend was cooling down a little so the game was played in more confortable conditions. Captain Bruce Dawson had his work cut out with several last minute changes of players, causing him to have to juggle teams to balance the handicaps. In the end he had 9 teams of 4 playing - totaling 36 players after rearranging several teams. This game is always enjoyed by members and final scores can be very close. This year the team – captained by Fernando Oliveira with Erik and Liesbet Herter and Derek McIvor – finished with a score of 60.3 closely followed by Kate Scheier’s team of her husband Tom, Caroline Yarwood and a guest Henry Lacey – they finished with a score of 60.6! The only other prize awarded was the Nearest to the Pin on the 18th green. This was won by the Dawson team captained by Mark and including Bruce Dawson jnr who was playing on a golf course for the first time and achieving a par on the 2ndwith no contribution from any other member of his team! Lunch and prize giving was held at the Restaurant Ponte Verde in Alcabideche where 36 members sat down to a delicious lunch of arroz de Tamboril, fruit salad and plenty of wine! Well, we did it! A huge victory by 5 matches to 1 in the 31st match between the Associação de Barmen and the RBCGS went our way. The gap narrows and we now trail by 17 matches to 12, with 2 drawn. However, if we think that by 2011 we were 17-6 down, 6 successive wins and a draw have engineered a good recovery. We must continue this trend in the years to come. The first match in 1988 was played in the Açores, which the Barmen won. At that time the Barmen had 120 members, today they only have 50. Conversely, the RBCGS had many fewer members, but today also have around 50 male members, on whom they can call for this match. No trophy has lasted so long, other than the President’s Baffy and it has become a desire by RBCGS members to be part of the team. The conditions were cloudy when we set out, but it rapidly turned into a warm day. The course could not have been in a more perfect state and there was no excuse to play poor golf. The most important factor was the spirit, in which the match was played. After the golf came the social side and the usual sardinhada was held at the more than “usual” Braga restaurant in Amoreira. Good spirit accompanied by 2 bottles of whisky led to the prize giving, which included prizes to best golfers on each side and the final lifting of the Trophy by the RBCGS Captain. The Final of the Gordon Young of the Putting competition was finally held on July 6th At the Estoril Golf Club. Finally, because the competition seemed to run for about six months! This is due to knock out stages stretching over these weeks and months because of members’ private commitments of travel, illness etc. Members gathered at the putting green to watch the two finalists, Andrew Jones and Chris Goulding fight it out! Battle commenced with Andrew slotting two quick hole-in-one putts knocking the very new Grandfather, Chris, off balance! After which it was catch up time with added pressure. The final result was that “Granddad” lost by 3 and 1 with the two six foot putts certainly winning the day for Andrew. Congratulations to both players. Bruce Dawson, Captain of the Royal British Club Golf Society refereed the game and presented the prizes. A side event caused great amusement with one of the Estoril gardeners getting down and “manicuring” the holes with a pair of scissors as can be seen in the photo! As the result of a generous invitation from Rod Sumner, an RBC member living in the Algarve and 2017 Captain of Quinta do Lago Golf Club, the RBC Golfing Society had played a team match at the Quinta do Lago earlier in the year. Such was the success of the event that we challenged them to a return match, to be played at Estoril Golf Club. Having lost the Algarve leg by 4 points to 2, the RBCGS was keen to even the honours. The fixture began with a reception on the evening prior to the match at the home of the Captain. The match, played on the afternoon of 26 September in hot and sunny conditions, involved 6 pairs on each side playing fourball better ball matchplay. The Quinta do Lago brought ten players from the Algarve, who were supplemented by two volunteers arranged for them by the RBCGS. One of these had not read the email properly and played an excellent game alongside Rod Sumner to win their match for the Quinta! As the games finished, excitement rose on the golf club terrace when it became clear that the overall result would depend on the last fourball out on the course. Happily, the RBCGS pair of Sally Buxton and Gavin Trechman held on for the narrowest of victories, winning 1up on the last green. Home advantage is always a factor on the tricky Estoril course and no doubt helped the RBCGS to victory by 4 matches to 2, neatly reversing the result in the Algarve. The highly enjoyable occasion was rounded off with a dinner at the Restaurant Quinta do Farta Pao. Hosting of this annual event rotates between the three societies and this year it was the turn of the PINGS. The match was held on their home course, the Quinta de Beloura. Each society fielded a team of eight players. As usual, the format was individual Stableford with the aggregate of the best six scores of each team deciding the result of the match. The match was played in sunny, but windy weather. The course was showing some signs of stress from the exceptionally dry summer, but still offered good playing conditions. The result of the match was a decisive win for the PINGS. Their team of crack players produced excellent golf, with the average score of their best six coming in only a fraction below 36 Stableford points. Runners up were the Tagus Golf Society, with the RBCGS trailing this year. The player with the best individual score, and winner of the crystal decanter trophy, was the PINGS’ Anna Siljedahl with a score of 40 points. This is always a friendly and lively occasion and that was evident at the post-match lunch and prize-giving, held at the clubhouse. PINGS captain Antonio received hearty congratulations from the losing captains, David Thomas and Guido Schnellen and retained the Tri-Soc Plate for another year. RBCGS will host the 2018 match and are hoping for greater success next time. There is no RBC trophy competition in August, but members keep their hand in by playing a relaxed Texas Scramble team game, held this year on Wenesday 9th August at Estoril Golf Club. As well as prizes for the best net scores by the teams, there was a prize for nearest the pin on the par 3 thirteenth hole. Thirteen was certainly not unlucky for Antonio Vieira, who won nearest the pin in the best possible way by making a hole in one – the first of his golfing career. Antonio retrieves the hole-in-one ball. The two under par score on that hole helped his team -Antonio, with Ian Yarwood, Carol Mason and Carol’s guest, Charles Booth – to win with the best net score, from runners-up, Fernando Oliveira, Lars Ryberg, Gavin Trechman and Auke Bos. In traditional fashion, Antonio celebrated his hole-in-one by treating everyone to bubbly at Restaurante Ponte Verde, where the after match lunch was held. For the thirtieth year running a match was played on 13th July between teams from the RBC and the Associação Barmen de Portugal. The event was held at the Estoril Golf Club where the greens were slow and sandy after recent maintenance. It is to be hoped that this did not affect the outcome of the contest. We had been promised, or threatened with, temperatures in the mid-thirties but in the end there was some welcome cloud cover and nobody succumbed to sunstroke or heat exhaustion. The format for the event was 4-ball matchplay, based on aggregate Stableford scores on each hole. Each side fielded seven teams of two. The match was very close. After the first six flights had finished the sides had won three matches each. The final flight involving the opposing Captains went to the 17th green before being decided in favour of the RBC. This was our third victory in a row following the tied match in 2014. The RBC is slowly making up ground in the series but still trails the ABP with 11 wins to their 17 and two matches tied. After the golf we enjoyed drinks, lunch, speeches and prize-giving at the Braga restaurant in Monte Estoril. Trophies were awarded for the best individual scores on each side; to Ian Yarwood for the RBC and Bruno Serra for the Barmen. Finally the impressive trophy was presented by losing Captain Joaquim Ribeiro and will spend another year with the RBC. Not the Open, but the Gordon Young Putter Competition! The Royal British Club Golf Society have a 18 Hole putting competition which is played annually at the Estoril Golf Club over the early months of the season . This year the draw consisted of 30 members who struggled and tried their best to win. The final was played at Estoril on Wednesday, 19th July and the two finalists were Sally Buxton and Pierre Laporte with Pierre winning with a result of 2 and 1. Members of the Club were invited to witness the match followed by a light lunch at the Club Bar. This is a very popular match which always shows up a variety of putting ability. Before the first match at the beginning of the season Gordon Young always gives a putting class, which reminds us what a great pro he is and which some members try to remember as they struggle through the matches. The next match - a Texas Scramble – will be played on August 9th. This, again, is an annual match enjoyed by all members. The next monthly Stableford competition sponsored by EY will be played on Wednesday September 6th at Estoril. The RBC Golfing Society was delighted to be challenged to a team match by the Clube de Golfe da Quinta do Lago. The invitation came about when Rod Sumner, an RBC member living in the Algarve, became Captain of Quinta do Lago in April 2017. An RBCGS team of ten players travelled to the Algarve for the match, which was played on 30th May, 2017 on the Quinta do Lago South course. Our numbers were bolstered by the loan of two Quinta do Lago members, including Rod’s wife Gwenda, who played brilliantly, so that we could field six 4-ball better ball matches. Most of the games were very close but, despite most of us having played a practice round in Algarve conditions on the 29th, local knowledge made the difference and the Quinta team won by 4 points to our 2. We and our supporting partners were very well received by the Quinta members, with a reception on Monday at the home of Rod and Gwenda Sumner and a post-match dinner at their magnificent clubhouse. We are looking forward to a return match at Estoril in September. The TRI-SOC is an annual golfing contest between 3 long established societies based in the Cascais/Estoril area: PINGS (originally a NATO based society now with broader membership), Tagus and the Royal British Club Golfing Society (both based at Estoril Golf Club). The event has been running since 1996, interrupted occasionally by the weather. This year there were again weather concerns with heavy rain in the days before the tournament, which was held at Estoril GC on 13 October. However, on the day, the weather gods were kind and the competition was completed in dry, warm if somewhat humid conditions, the course having stood up well to its drenching, though of course ground conditions were not perfect. Each society contributed a team of 8 and the outcome was closely contested. RBC GS actually topped the points scoring table with an aggregate 239 points for their 8 players, with Tagus on 232 and PINGS on 226. However, following the long established format for the event, the result was determined only by the total of the best 5 out of 8 stableford scores of each team. On that basis the winners this year were PINGS by narrow margin from RBC GS and then Tagus. Ewan Rankin (RBC GS) deals with a tricky bunker shot. There were a number of fine performances notably John Hagan (PINGS), Ron Goddard and Mans Hoglund (RBC) who all scored 33 points. However, clearly the best round of the day, and the deciding factor in the outcome of the event, was the round of Peter van den Berg, playing for PINGS. His round of 41 points, playing off a handicap of 11, was described as a master-class by his playing companions and a joy to watch. Friendly Rivalry - Cindy Weeks (PINGS) and Selwyn Kennard (Tagus). At the lunch following the event, held in the Estoril GC Restaurant, host Andrew Jones (Captain of RBC GS) and David Thomas (Captain of Tagus) offered their congratulations to PINGS and to Peter in particular. Winning Captain Ian Bolwell praised the spirit in which the match was conducted and we all look forward to next year’s event. The 28th playing of the annual tournament between the RBC GS and the ABP took place at Estoril Golf Club on 9 July. The event pits two teams of 12 against each other in a pairs combined-stableford, matchplay format. Teeing off at 7.30 am on another gorgeous Lisbon Coast morning, the players were able to make considerable progress before the building heat started to drain reserves of concentration and energy. This tournament was long dominated by the Barmen – no-one knew how they found the time in their long shifts to hone their skills, but year after year they built up a substantial lead in the fixture, winning 9 out of the first 10 outings. Since then, gradually, the pendulum has begun to swing and after a 4-2 victory this year the standings are ABP 15, RBCGS 11 with 2 tied matches. RBCGS retain the trophy for the fourth straight year. Initial signs for 2015 were good. After a tight match David Gray and Ad Hüttl took a 3 and 2 victory in the first four ball. Ron Goddard and Bill Buxton in the second flight had arrived at the 15th tee dormy 4, but their opponents won the next 3 holes. However, Bill held his nerve to hole a tricky downhill 3 footer for the win on the 18th. In the third match Derek McIvor and Chris Goulding met a team in less good form and won very comfortably. The Barmen struck back in the 4th flight with their best combined score of the day to defeat Ewan Rankin and Ed Robbins. So, with RBCGS needing half a point for victory, this year’s fixture hinged on the 5th match. On the 16th tee the match stood all square. Players Richard Evans and Selwyn Kennard had been 4 holes down and fought their way back to parity. To their great credit they reeled off the last 2 holes as well to finish 2 up, having won the last 6 holes! That decided the overall contest but the last match was equally exciting – Hans Ludolphi and Paul Guerault had been 3 holes behind but fought back to only 1 down with 2 to go, then they won the 17th! The Barmen showed their determination, though, by wining the final hole and that match. At the prize-giving lunch in the Restaurant Braga awards were presented to the two highest scoring individual players – Belmiro Rebeiro of the Barmen (and brother of Captain Joaquim Ribeiro) and Hans Ludolphi of RBCGS, both players amassing a very creditable 38 points. Joaquim Ribeiro then presented the trophy to RBCGS Captain Andrew Jones, congratulated all the players on the spirit in which the competition was played and looked forward to recovering the trophy next year. Andrew took credit for the tactical masterstroke that relegated him to the reserves bench and thanked Joaquim and the Barmen for a thoroughly enjoyable day. Hans Ludophi receives his trophy for the best RBCGS score. Early this year RBC’s favourite golf professional, Gordon Young, suggested a new event for the Society. He drew attention to the importance of putting in the game of golf and the relative lack of practice time spent on that crucial skill. The Gordon Young Putter is a knock-out competition which has been played for the first time this year, between February and the final on 1 June. Twenty four members of the Society participated in the event. Despite the Society’s name 3 of the 4 semi-finalists were not Brits, The finalists were Mans Hoglund and Paul Guerault and their match was played out over 18 holes on the putting green of Estoril Golf Club. It was an exciting match. Mans took an early lead after three holes, almost holing out from 20 metres. On hole 5 Mans did hole out from about 8 metres and look set to double his lead. But Paul is made of stern stuff and he followed Mans in with a beautiful putt. Not content with that, on the 6th, Paul repeated the one putt strategy and squared the match again, before going on to take the 7th with a 2 putt. After sharing the next two holes it was Mans’ turn to apply the one putt pressure on the 10th and again on the 12th to gain a two hole lead which he never lost, ending the winner by two and one. Gordon Young congratulated both players on really excellent putting and the enthusiastic supporters added their applause to mark the completion of a very enjoyable and exciting event, RBC GS Captain Andrew Jones presented the prizes and both finalists, in their remarks, acknowledged the contribution that Gordon Young’s advice had made to their improved putting. The annual contest between the Royal British Club Golfing Society and the Associacao de Barmen de Portugal took place on July 17th at the Clube de Golf do Estoril. The format, as has been traditional, was combined Stableford matchplay and it went down to the final fourball and a win for the RBCGS to result in an overall tie in the match. This enabled the RBCGS, as the existing holders, to retain the trophy for another year. At a lively and convivial lunch at the Restaurant Braga in Monte Estoril, the respective Captains presented prizes for the best score in each team – Ewan Rankin for RBCGS with 39 points and Joao Roquette for ABP with 37 points. Best wishes were also given to Ormond Fannon who was celebrating his birthday on the day.